Raoul's Cafe and Bar is so continental! If you haven't been on holiday for a long time then go here as you'll feel like your sitting in some delightful little Parisian cafe in no time. Thank you Raoul for giving us Londoners somewhere really worth visiting. Raoul's cafe and bar do some excellent stuff - good food served by really friendly and helpful staff. For those of you in Notting Hill, I can highly recommend Raoul's - I'm pretty sure you won't be disappointed. 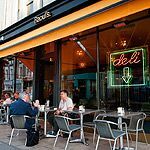 Situated in a quiet corner in the heart of Notting Hill, Raouls Cafe is a great place to know about because it offers outdoor dining in fine weather as well as breakfast and brunch, which obviously makes it very popular at the weekend. 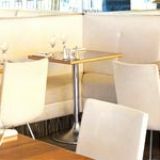 The restaurant is not far from Ledbury Road and is within walking distance of some of the most serious fashion shopping in London. Raouls Cafe has a sister restaurant in Maida Vale and also boasts a delicatessen in the same area where you can buy some of the ingredients used in the restaurant at Raoul’s. Recently redecorated, the restaurant now has classy black printed wallpaper and large pompom shaped wooden lampshades. Part of the restaurant has a raised floor where you can sit for more intimate dining. 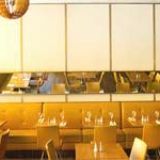 Popular with young locals, this restaurant also boasts an educated literati clientele with aspiring playwrights and literary agents as well as mothers with children. The restaurant is busy but not noisy and is definitely the place where you can have a good intellectual conversation. An interesting and tempting starter is the butternut squash, feta and parsley patties served with sweet chilli sauce. However, the feta is slightly overpowering so the squash does not taste of much, and it’s hard to pick up the patties because they are too liquid. The grilled halloumi cheese salad is another option for a starter and is served on a medley of grilled vegetables including aubergines, peppers, courgettes and fresh mint. The contrast of the cheese with the vegetables is very good, but the halloumi is a little dry and too salty. More grilled vegetables would be a good way to counteract this. Main courses include Shish Raoul’s, which is breast of chicken kebab with grilled pita bread and herb mayonnaise served with very crisp French fries. This dish is worth trying, however, the chicken, is a little dry and lacks a bit in flavour. Another main course worth trying is the crab and chilli linguine, which can be served as a main course or a starter. Linguine and crab is the traditional way to serve the pasta on the Italian island of Sardinia, but the linguine is a bit too thick and the pepper overpowers the crab. Desserts include an excellent strudel which must be tried because it is very light and well balanced with the nuts complimenting the apple, sultanas and cloves without overpowering them. Also recommended is the affogato, less luxurious than in other restaurants, but nevertheless served authentically with a scoop of vanilla in a glass, drowning in fresh strong Italian espresso. The house white compliments the Meditteranean and Middle Eastern food served at Raouls and is an Italian wine called Verdicchio de Castelli di Jesi 2006. Wines are only available by the glass and this one weighs in at just under £4. 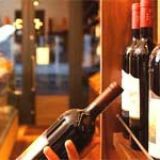 If you prefer to drink red wine, the cheapest is South Africa’s Waker Bay or at the other end of the scale there is Rioja Crianza which costs around £6 a glass. 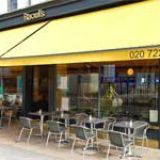 If you live in Central London, then Raouls Cafe is a great place to go all round the clock, and its probably at a pinch even worth crossing London for because of the variety of the Meditteranean and Middle Eastern cuisine combined with the great location for shopping and meeting people.